Instructions: The card base measures 6 inches by 6 inches. To make this, cut white card stock 12 inches by 6 inches and score at 6 inches on the longer side. Fold to make a top folding card. Cut pattern paper from paper collection, a little smaller than the card base and adhere to the card front using clear glue. Cut out a pocket from the pattern paper using the scalloped border from border die and adhere to the base of the mat layer, leaving the opening to insert tags. Cut the decorative dies and the eyelet border dies from white card stock and adhere the decorative die cut on the top of the mat layer and adhere the border die cut matching with the pocket on the card front. 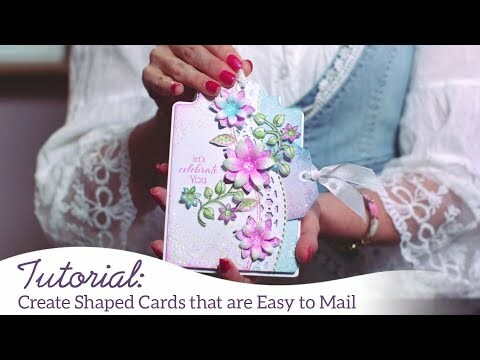 Cut a doily die cut and adhere to the card front. Cut two from Furry friend die set. Cut out a small window from the first circle die cut. Stamp the round sentiment from the stamp set with black ink. Adhere a small piece of acetate sheet to cover the window from backside. Add the foam strip all around the window on the back. Lay this on the flat surface facing down. Add flower pearls and cover with the second circle piece. Adhere this shaker element on the doily die cut. 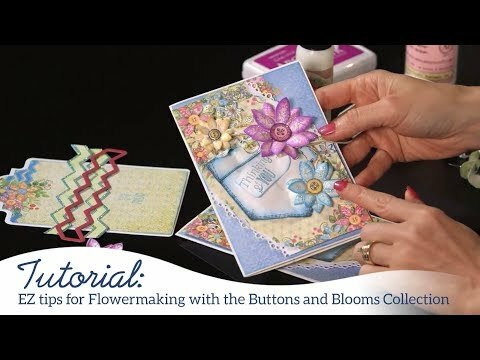 Stamp the flowers in purple and red ink from Buttons and Blooms collection. Stamp the image from the patchwork daisy collection using Library Green for leaves and purple and red ink for flowers. Sponge daubers can be used to color flowers. Cut with matching die. Shape the flowers on the flower shaping tool kit with groove tools. Add colored stamped images from the patchwork daisy collection around the shaker element. Add the images on the top of the card front. Add the flowers on them. Stamp and cut some buttons. Shape them and adhere in the flower centres with glossy accents. Apply glossy accents and glitter. Cut two tags from the tags die set. Add the buttons on top and add the tags inside the pocket.